The kitchen can be a big deal. Counter space is hard to come by in most kitchens so finding more space, especially for entertaining, can be a real challenge. 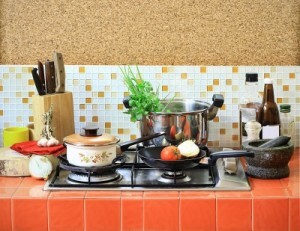 Consider boxing some of the large appliances that you won’t need–at least for the holidays. Instead of using a dish rack on the counter, empty the dishwasher and use the empty racks as you would the dish rack. Once the dishes are dry, put them away so you can use the dishwasher again. If part of your kitchen is used as an office, put lose items and papers in baskets for a neater appearance. Or box the items until after the holidays. Remember. Don’t worry about cleaning right now. That will be done in stages beginning on Saturday. For now, just look at clearing the counters.